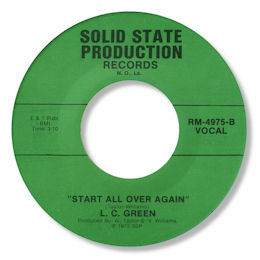 Yet another New Orleans obscurity from L C Green – but what a winner it is. Both the funky little dancer “What You Been Putting Down” and the tasteful mid paced Start All Over Again get 5 stars here. Green’s rich dark voice is full of purpose, very well modulated and when he uses his falsetto the whole sound moves up an emotional gear. The arrangements feature horns and a strong rhythm section with not a synth to be heard. Which is just fine by me. Recorded just before this sort of classic southern soul all but disappeared from view.